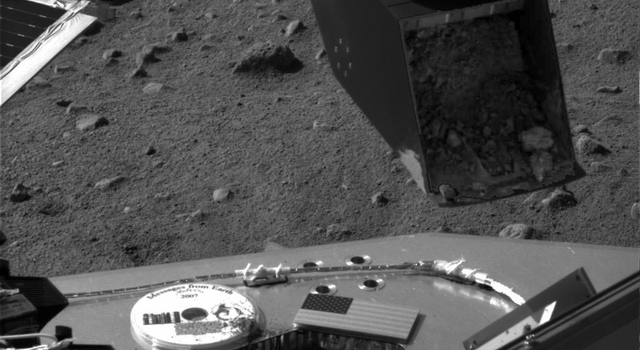 TUCSON, Ariz. -- The arm of NASA's Phoenix Mars Lander released a handful of clumpy Martian soil onto a screened opening of a laboratory instrument on the spacecraft Friday, but the instrument did not confirm that any of the sample passed through the screen. Engineers and scientists on the Phoenix team assembled at the University of Arizona are determining the best approach to get some of that material into the instrument. Meanwhile, the team has developed commands for the spacecraft to use cameras and the Robotic Arm on Saturday to study how strongly the soil from the top layer of the surface clings together into clumps. 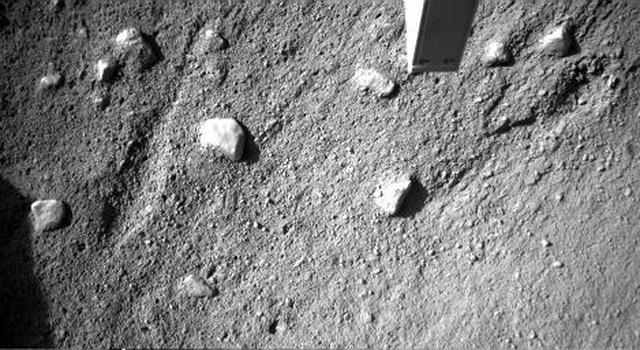 Images taken Friday show soil resting on the screen over an open sample-delivery door of Phoenix's Thermal and Evolved-Gas Analyzer, or TEGA, an instrument for identifying some key ingredients. The screen is designed to let through particles up to one-millimeter (0.04 inch) across while keeping out larger particles, in order to prevent clogging a funnel pathway to a tiny oven inside. An infrared beam crossing the pathway checks whether particles are entering the instrument and breaking the beam. "I think it's the cloddiness of the soil and not having enough fine granular material," said Ray Arvidson of Washington University in St. Louis, the Phoenix team's science lead for Saturday and digging czar for the mission. "In the future, we may prepare the soil by pushing down on the surface with the arm before scooping up the material to break it up, then sprinkle a smaller amount over the door," he said. Another strategy under consideration is to use mechanical shakers inside the TEGA instrument differently than the five minutes of shaking that was part of the sample-receiving process on Friday. No activities for the instrument are planned for Saturday, while the team refines plans for diagnostic tests. Phoenix's planned activities for Saturday include horizontally extending a trench where the lander dug two practice scoops earlier this week, and taking additional images of a small pile of soil that was scooped up and dropped onto the surface during the second of those practice digs. "We are hoping to learn more about the soil's physical properties at this site," Arvidson said. "It may be more cohesive than what we have seen at earlier Mars landing sites."